Award winner built with outstanding details throughout whole model and very high standard accuracy on every individual part, beautiful IDF desert color scheme, add brass photo-etched parts and metal ball chain armor, add clear parts and track links, turn-able turret and gun, add on vehicle tools and more accessories, special on heavy weathering finish and more add on details. Top building quality with great detailed over all. Add PE metal ball chain armor. Add brass PE engine grill and more. Excellent exterior features (great rivets, engraved panel lines and appropriate weld beads) - Super detailed rivets, engraved panel lines and appropriate weld lines. High detailed turret and components including appliqué turret armor, separately molded hatches and on-vehicle equipment. Superb suspension and wheels detail. Add on vehicle tools and more accessories Airbrushed and painted, base color with primer for better detail and shading, multi-color filters for blend color effects, oil and water wash with panels, doors, rivets finishing, detail paint job on rust and paint chips off with scratches looking, worn and bare metal realistic simulating, flow rust and rain streaks effects, great engine smoke representing, also smear and dirt with mud and dust appearing, dry brushing to emphasis and highlighting texture with edge for good wear and fading, more on real live weathering with decals and unit markings, final protective layer for long term collection. The Merkava Mk 2 entered production in 1982 with first production vehicle being completed in August 1983. Main improvements over the original production model include a layer of special armour on the front and sides of the turret, special armour on the hull front, the 60 mm Soltam Systems mortar is mounted in the left side of the turret roof and can be loaded and fired from within the turret, and the steel skirts that protect the suspension are backed by special armour. The Merkava Mark II was first introduced into general service in April 1983 and incorporated several upgrades as a result of the previous incursion into Lebanon. The new tank was optimized for urban warfare and low intensity conflicts, with a weight and engine no greater than the Mark 1. 2 was designed long before the Lebanon War (1982). 2 was designed as early as the late 70s, when the first model Merkava Mk. Variants : Merkava IIB: with thermal optics and unspecified updates to the fire control system. Merkava IIC: with more armor on the top of the turret to improve protection against attack from the air. Merkava IID: with next-generation modular composite armor on the chassis and turret. The item "Award Winner Built Academy 1/35 IDF Merkava II Main Battle Tank +PE" is in sale since Saturday, December 31, 2016. 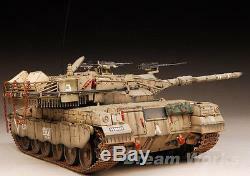 This item is in the category "Toys & Hobbies\Models & Kits\Military\Armor". The seller is "dreamworkshobby" and is located in Scarborough, Ontario. This item can be shipped worldwide.